Why are the fanboys rushing to defend Apple’s child labor record? Presumably, the commentator wouldn’t have felt so lucky if he’d been employed at the iPhone manufacturer in Suzhou that recently exposed 49 workers to toxic n-hexane. Snark aside, what distresses me most is an apparent erosion in the standards expected of developed-world companies operating in the developing world. Twenty years ago, when NGOs first started organizing around labor abuses at Nike and other foreign manufacturers in the developing world, misconduct much milder than what’s happening at Apple was cause for protest and boycotts. What’s changed in the intervening years? I’m inclined to say that consumers in the developed world have become acclimated, if not accustomed, to the idea that affordable products must be manufactured in facilities that don’t meet the minimum requirements of their home markets. But I’m not convinced, and I’d be interested in hearing other perspectives. However, I am convinced of this: the Chinese public isn’t acclimated to the idea that companies like Apple demand and ensure better working conditions for employees and contractors in San Francisco, than they do for employees and contractors in China. So far, there’s been little call for Apple to rectify that situation. But as the self-reported violations pile up, I have no doubt that Chinese consumers will start to wonder why, and Apple’s advantages – whatever they might be – will start to erode in a market that the company covets badly. In the trenches, sorting scrap. Sheepishly, I concede that this is the second or third post in which I’ve promised to get back to regular blogging shortly. But, you know, Chinese New Year leads into a new year of work, and now I’m bogged down in a couple of projects that require my fixed attention. In the case of one project, it feels a bit like sorting scrap – fines, to be precise, the exceedingly small pieces of mixed metals that come off metal shredders and are exported to China and other low-cost labor countries for hand-sorting. Below, an image taken at a facility devoted to this kind of recycling in Guangdong Province. 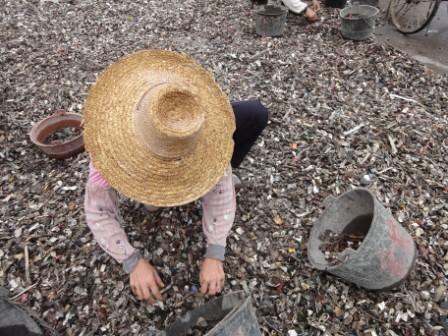 In the interest of dispelling some stereotypes: being able to identify, by sight and feel, various metals, is a skill, and the women who do this work – and they are mostly women – are highly sought by Guangdong’s recyclers, and highly compensated (by Chinese labor standards). For example, the woman in this photo is paid between RMB 2000 (US$291)and RMB 2500 (US$365) per month, for a forty-hour week, and she would have no problem finding another job, tomorrow, for similar wages, at a similar facility. Entry-level white collar workers in the same town would have a very hard time finding similar pay. In any case, I’m sorting facts and figures (though I’m hardly as adept as a good south China metal sorter), sentences and paragraphs, and hoping to be free and clear in a day or two. In the meantime, I hope you’ll join me in wishing the China Beat – one of the truly great China blogs – a happy third birthday. Even if you don’t visit China blogs on a regular basis, the anniversary post is worth reading as a quality guide for how and why to blog as a group. Very impressive. The Chinese New Year holiday is coming to an end, and so is this blog’s reticence on a range of issues. We should be back to full-strength – or pretty close – early next week. For now, one quick Chinese New Year item that I meant to post before the holiday, and forgot. Here’s the deal: back in January, World Expo 2010 organizers told Shanghai Daily that nearly 20% of the more than 100 pavilions to be built for the massive event would not be ready for the opening on May 1. Part of the problem – and it was a big one – was that much of the migrant labor force required to build the 2.5 mile fair-ground and its pavilions was planning to take two weeks off to enjoy the New Year holiday. Below, some of those laborers enjoying a break outside of the terrific Dutch pavilion. Anyway, a few days before the Shanghai Daily story ran, I happened to be at the Expo site, visiting one of the incomplete national pavilions (to be clear: not the Dutch pavilion). While there, someone associated with the structure told me that – out of fear of losing the structure’s two-hundred man labor force – New Year bonuses were being offered. According to this person, the regular daily wage at this particular pavilion (can’t speak for the others) was/is RMB 200, or roughly US$29.00/day. 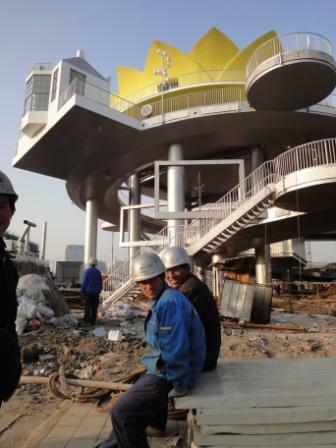 That’s one hell of a good wage for a Chinese construction worker, but – apparently – not nearly enough to keep a migrant worker with leverage – in this case, incomplete Expo 2010 pavilions – in his back pocket. And so, according to the national pavilion official with whom I spoke, cagey/homesick migrant laborers rejected offers of RMB 400 (US$58), RMB 600 (US$87), and RMB 1000 (US$145) per day to work during the two-week Chinese New Year. Those are serious wages for white collars in Shanghai, much less a migrant construction workers, and I hereby offer my sincere respect to whomever was responsible for the migrant side of that negotiation. Alas, I didn’t manage to follow-up on what the ultimate outcome/wage was, but – with labor rates like that – I suspect that more than a few migrants called home to ask that the fireworks be lit without them. Year of the Tiger blogging, coming next week. I spent the first half of November on assignment in Guangdong Province, and though I can’t say too much about what I was up to down there, I did come across some interesting labor-related items unrelated to my assignment. So. In the space of two weeks I managed to visit 11 factories tightly connected to the export manufacturing sector (either as direct exporters or as raw material suppliers to exporters), and interviewed another dozen. No surprise, all but one conceded that business is down from 2008 – in most cases, between 30% and 50%. At the same time, there was near universal agreement that the numbers would be far more grim if not for China’s economic stimulus which – according to several participants – is directly accounting for some 60% of the economic activity in Guangdong – the famous/notorious export “workshop of the world”- at the moment. What does that mean, precisely? One example: below, at a factory ordinarily devoted to manufacturing electrical equipment for export industries, workers instead hand-assemble electrical transformers for government hydro-power projects.